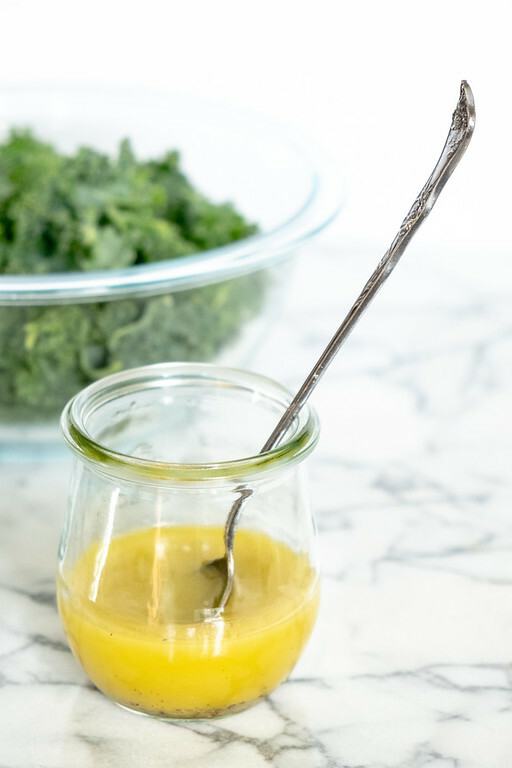 Once you taste this Homemade Lemon Vinaigrette Dressing, you’ll never use store bought dressing again! So easy and delicious and you know all of the ingredients in it! Perfect salad dressing on almost any salad! Don’t Buy Store-Bought Salad Dressing! Seriously. Do not buy salad dressing from the store! Have you looked at the list of ingredients on the dressing? What is all that stuff? Things I can’t even pronounce! Store bought dressings can be high in sodium, sugar, preservatives and some even contain MSG. This article from Eat This, Not That breaks down 20 of the Best and Worst Store-Bought Salad Dressings. So, if you want to keep an emergency bottle of salad dressing on hand, you can work from that list. But really, make your own!! It takes maybe all of 5 minutes to put together a quick and easy vinaigrette. This lemon vinaigrette dressing that I’m sharing today is my go to dressing. With only 5 ingredients and barely 5 minutes to prepare, perhaps I should have called in my 5 in 5 dressing! It’s also worth noting that you recognize and can pronounce all 5 ingredients. Step 1 – Gather your ingredients and tools. You’ll need a lemon, a citrus juicer (or you can squeeze with your hands,) a zester, extra virgin olive oil, honey, salt and pepper. Step 2 – Add olive oil, lemon zest, lemon juice, honey and salt and pepper into small jar. You can also use a small bowl, but I like the convenience of a jar. Tips – zest your lemon before juicing! I use a Microplane zester to zest right into the jar. You can squeeze the lemon by hand, but I find a manual citrus press works great for small jobs. Step 3 – put a lid on the jar and shake to combine. Alternately whisk the ingredients if they are in a small bowl. Tips – I use a small jar to make my vinaigrettes. Shaking seems to work so much better than whisking for me, especially if the dressing has honey. It also allows for easy storage in the refrigerator. 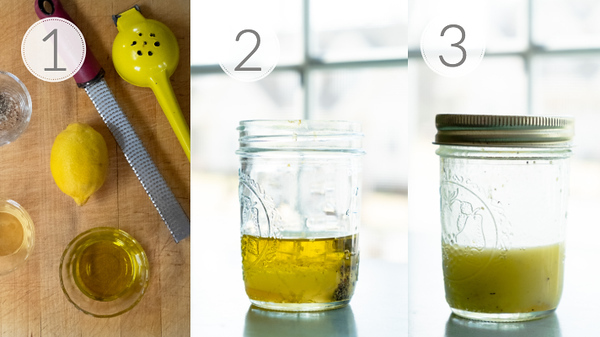 See how easy it is to make your own homemade vinaigrette. 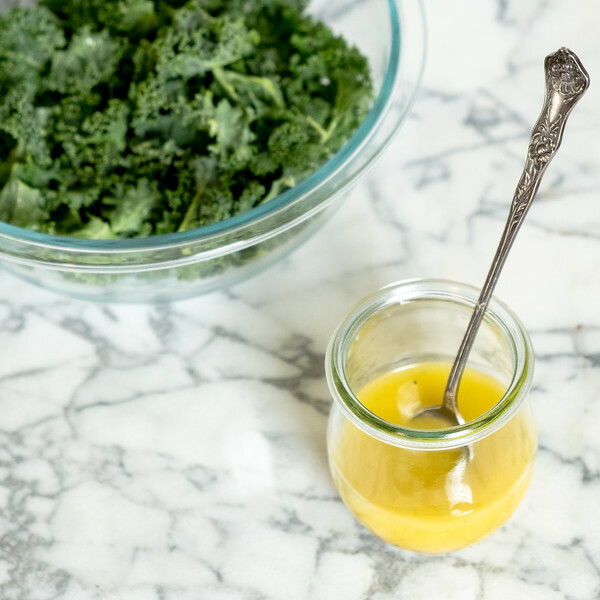 This lemon vinaigrette will taste so much fresher than any store-bought dressing and just look at that color! How to store homemade vinaigrette – I store mine in the same jar that I made it in, in the refrigerator. I take it out about 30 minutes before I want to use it to allow it to come to room temperature. How long will homemade vinaigrette keep – I keep mine for about 2 weeks, but honestly we go through it much faster than that. Once you have this delicious dressing in your refrigerator, you’ll be making salads all the time! Don’t forget that you can sign up to receive an email every time a post goes live. I’m going to do a series of homemade vinaigrettes and you don’t want to miss any of them! Click here –> Sign up to receive email updates. This easy homemade lemon vinaigrette dressing will become your go to salad dressing. With only five ingredients and ready in about 5 minutes! Add all ingredients to small glass jar or small bowl. Put a lid on the jar and shake to combine, or whisk ingredients in small bowl. Zest your lemon before juicing! I use a Microplane zester to zest right into the jar. You can squeeze the lemon by hand, but I find a manual citrus press works great for small jobs. I use a small jar to make my vinaigrettes. Shaking seems to work so much better than whisking for me, especially if the dressing has honey. It also allows for easy storage in the refrigerator. I’ve never used bought dressing as it’s so easy to make it yourself with deliciously fresh ingredients. Let’s hope you have started a movement Pam! Yes, it’s so easy and tastes so much better! I’ll be making this one. Need to get away from store bought. Really, it’s so easy and it tastes so much fresher than store-bought!